My adventures with Taiwan’s folk traditions continues and this time I head to the usually quiet town of Toucheng, Yilan（頭城,宜蘭）to go see some burly men climb some very high spires. Toucheng’s Grappling with Ghost Festival or Qianggu (頭城搶孤) is held every year on the last day of the Ghost Month. Wait, Ghost Month? Taiwan has a whole month dedicated to ghosts? Yes indeed, it does. Ghost Month (鬼月) refers to the Hungry Ghost Festival, a grand belief that every year during the 7th month of the Lunar calendar, the gates of hell are thrown open, freeing ghosts and spirits to roam into our world. The thought of restless and transient spirits co-existing with humans is intriguing to not only the Taiwanese but also to most nations that share the same Taoist and Buddhist heritage, including Hong Kong, Malaysia, Japan and Viet Nam. The wandering ghosts（孤魂）are believed to be the ancestors of families who have forgotten to pay tribute, or are those who have died without proper burials. They meander the human world searching to fulfil what they have been missing, like food and entertainment. To appease them, believers present them with live performances and offerings, including animal sacrifices. I’ve heard foreigners and even locals alike scoff and dismiss the idea of ghosts. “Just superstitions”, they’d say. Well sure they can be regarded as such in this day and age, but let’s not discount centuries of folk religion and whole cultures that have survived modernity and other influences, shall we? Apart for its cultural and historical significance, I attended yesterday’s Toucheng’s Grappling with Ghost event because it’s a spectacle that’s also rare to come by. How many events do you know that have teams of men competing against each other to reach the top of gigantic pillars? Pillars reaching more than 20 metres to be exact. For the main event of gupeng (孤棚), the base poles made from Chinese fir measure around 13 metres in height and 8 metres wide. To make it even more challenging, they are greased with what is reported to be butter but looks more like your average motor oil. With nothing but a few lengths of rope and pure grappling strength, each team consisting of five of their best make the slippery climb to the platform. Only to face another 8 metres of bamboo trestles to reach the top. You’d think that is a good enough feat, but whoever manages to get past those two stages must lop off the top that completes the towers. Only when they manage to take down the flag can they then be declared the winner. Grappling with ghosts in this way is said to scare away bad spirits. Winning climbers receive much admiration and prestige…and are assumed great fortune for the rest of the year. The following pictures may be too raw for some. Chinese Opera performances were seen at two different stages. Front row seats at such performances during Ghost Month are always vacant. Ghosts are believed to occupy them. A man offers his ancestors some incense. Guhun or lonely souls are believed to be restless because they have been forgotten by their families overtime. To prevent this, believers offer the proper rituals to the familial deceased. A rooster carcass lies pathetically on that of a tattooed pig. A row of animal sacrifices is a common theme at the event. A rooster rests on a pig, of which underneath hangs a live carp. If anyone can help me decipher the meaning of these animals placed in such a way, please get in touch. The makeshift temple in which believers go to ask for blessings and safeguarding against evil spirits. Copyright of Guang-Hui Chuan. I heard the commentator say the spires were constructed from 6am that morning, and greased with about 120 gallons (450 litres) of butter. Quite an incredible effort considering it was all ready in about 12 hours. Competitors get covered in grease as they go through phase 1 of the climb. Its not over… One competitor heaves himself over the ledge, only to climb another 8 metres of bamboo lattices. Getting there: Forget the train, Kuo-Kuang Bus 1877 will take you straight to Toucheng in less than an hour. Main points of departure are from Yuanshan Station, Nangang Station or Nangang Exhibition Hall Station. When: Going by the Gregorian calendar, this event will vary year after year. However it will always abide to the last day of the 7th Lunar Calendar Month. So you just have to ask Google for future dates and details. I find Googling the Chinese characters 頭城搶孤 provided the best results. If you get there around 9pm, that leaves you plenty of time to eat, drink and do. The grappling starts at 11pm. Pro-tip: There are a few taboos that you should know if you are visiting Taiwan during Ghost Month. Not everyone is superstitious but it’s a nice to know. Because you don’t want to get reprimanded, out of the blue, like I did. (Whistling at night, as I passed an elderly man in a park. Oops.) Here’s a great video to watch. As always, my greatest thanks to fellow adventurer and photographer Guang-Hui Chuan. Head to his website GSquaredTravel for even more amazing captures! No surprises here but there’s a reason why it deserves to be mentioned over and over again. That stench you smell when walking around night markets and the occasional Taiwanese eateries is fermented tofu. What I especially appreciate is that there is no fixed formula on how it is made, which means there is a wide representation of flavours depending on regional and individual taste. Furthermore, how it is prepared to be eaten can also vary greatly… Steamed, grilled, deep-fried, stewed or even served uncooked. I have come to love this beast of a fermented dish, probably because not only is it actually tasty, I get a great sense of satisfaction once I overcome the smell and in discovering that eating different preparations at different locations provide me with different taste experiences. It’s a little adventure for my tastebuds! If you haven’t tried it already, most of what you find really isn’t bad at all. The smell usually dissipates once you take that first bite and you will be rewarded for your bravery with deliciousness. At Yilan’s Dongmen Night Market (宜蘭東門觀光夜市). Deep fried is great for the beginner…there is hardly any smell to it and the crispiness coupled with the pickles can get addictive. At Taichung’s Fengjia Night Market (逢甲夜市), you could try deep fried red tea stinky tofu. It was amazing! Moving onto steamed tofu, the taste gets stronger and probably harder to get pass the smell for some people. Ask for extra basil if that’s the case! I ate this one at Steamed Stinky Tofu Boss (臭老闆現蒸臭豆腐). It was awesome. Of all the seemingly most useless parts of any animal to eat, the rear end and the skin it comes in probably hits the mark. I always used to walk by these without a second glance because I didn’t see any value in eating them. Stewed bits of fat that are then thrown into hot oil for some deep frying sounds like a journey towards a very unhealthy waistline. But trying new things and getting to know local flavour will always win over counting calories for me. Moreover, it really is worth the while! Chewy and slightly sweet and sticky from the sauce it’s stewed in, makes a winning combo. And to be perfectly honest, it’s pretty genius that they think of such delicious ways to serve what is assumed off-cuts and inedible. I highly recommend you grab a bag of these and accompany them with some light drinking with friends! Just make sure it is made fresh to order because nothing is worse than trying to swallow cold lard. At the first encounter, this street snack is glaringly alarming to look at. Large intestines stuffed with long lengths of chives does not give the impression that it would be delicious, but as with the chicken bits and bobs mentioned above, this bewildering street snack provides you with all the textural pleasures in one bite. Done right, it’s crispy yet chewy, soft, but also has a slight bite. Combined with that savoury sweet stickiness you can easily associate with any honey-glazed dish, it is sure to delight you if you can look past its appearance. It’s one of my favourite go-to-snacks when I feel like indulging, because this doesn’t come cheap like the others. One tiao 條 (length) will set you back about 100NT, which is easily 3-5 times more than your other stewed and deep fried goods. But it is that yum! Again…makes an excellent pairing with your alcohol of choice. Don’t judge a book by its cover. Don’t judge food with pre-emptive disgust. Besides congee, this is my happy meal when I need something warm and comforting in Taiwan. This modest noodle dish originated from Fujian (福建), a province located just across the way in China. When migrants from this region settled down in Taiwan about 300 years ago, they continued to make their poor-man’s dishes. Though unremarkable as it may seem, Mian Xian is undoubtedly one of the signature dishes of Taiwan, and for good reason. The iconic small and delicate rice and wheat-based noodles are suspended in a thick soupy broth made from oysters or intestines or both, giving it a naturally sweet savoury flavour. Served with coriander, sometimes basil, but always piping hot, this humble meal would be sure to help soothe that cold or warm you up on a drizzly day. My humble takeaway street food, that I happily consumed in a cafe next to a flat white. Because Taiwan is really that relaxed. A culinary institution, Ay-Chung noodles is another must-eat when visiting Ximending, Taipei. @ A Quan Mian Xian (阿泉麵線 台北市中正區許昌街26之3號) I get the best of both worlds. I love eggs. Who doesn’t? But when you venture into the world of preserved eggs, it’s a whole different story. I can’t imagine not pairing my silken tofu or congee with the occasional century egg. Or what a shame it would be if I had never tried iron eggs with its complex layers of flavours. I didn’t think preserved eggs were anything weird until a fellow westerner told me she couldn’t wrap her head around salted egg in a sweet (ie: moon cakes). But then, how different really is it to salted caramel tarts? Both use salt to enhance the sweet flavours, and there’s egg. Perhaps I break down food into their simplest forms too easily, but I have grown to accept preserved eggs as a fact of life. Afterall, they have stuck around from millennias ago. 皮蛋 – Century egg is preserved in an alkaline mix of clay, calcium oxide, ash etc which breaks down some proteins resulting in complex layers of flavour without being salted. The texture is a creamy yolk with a light jelly-like outer layer. It’s good in any preparation and I am particularly attached to this version – Century and lean pork congee. 鐵蛋 was a little treat I had only come across once I arrived in Taiwan. It’s stewed in sauce and spice and everything nice and goes well with beer! I eat like a local whenever I can, because these dishes are usually the freshest around. And that includes slurping down a bowl of pork liver soup which I’ve come to love. There are small eateries all over Taipei where you can have your choice of offal soup to complement your meal. Kidneys, stomach, tripe, hearts…what have you. Poor man’s food, is good hearty food, and you can find locals lining up at some places just to get their hands on one of them fresh bowls. Disgusting? no. Just smart and economical. And delicious. 豬肝湯 (Pork Liver Soup). They can also come with noodles in some places. I recently discovered this wonderful place. Come early, because they’ll be a line of locals! (台北市信義區松山路538之2號). The soup paired with Lu Rou Fan 魯肉飯 (braised pork rice) was exceptional. Despite its literal translation is meatballs, this one looked so strange to eat that I didn’t taste test it until about a month ago. And I totally regret not giving it a go earlier, because these are amazing! The meat (almost always pork) is actually contained inside either a soft or chewy layer of glutinous rice flour (I prefer the soft ones). They are then either steamed or boiled with a healthy serving of various sauces for consumption. Sometimes you see them as almost translucent with a reddish centre when they are cooked through. Either way, they are not the gluggy mess I assumed them to be, and make a quite filling snack. Vegetarian options are available. That’s it for now, but I’m sure I’ll be able to find more weird and wonderful food to report on. I hope this post has rendered you both hungry and adventurous! Next time you find yourself at such small eateries, just try them out. Bridge that gap between your own perceptions and what is actually, perfectly, deliciously edible. Remember the pie also had such humble beginnings. What to do when you have a couple of days to spare, and you want to get out in the open air without travelling too far from Taipei? Yilan County (宜蘭縣) is probably the answer to an easy destination with plenty of different things to do! Here are a couple of places my friends and I hit up and especially enjoyed while on our mini vacation. Nearly every Yilan travel book would tell you about this place. Yes it’s a popular spot, but it really is not as crowded by bathers as one would think! 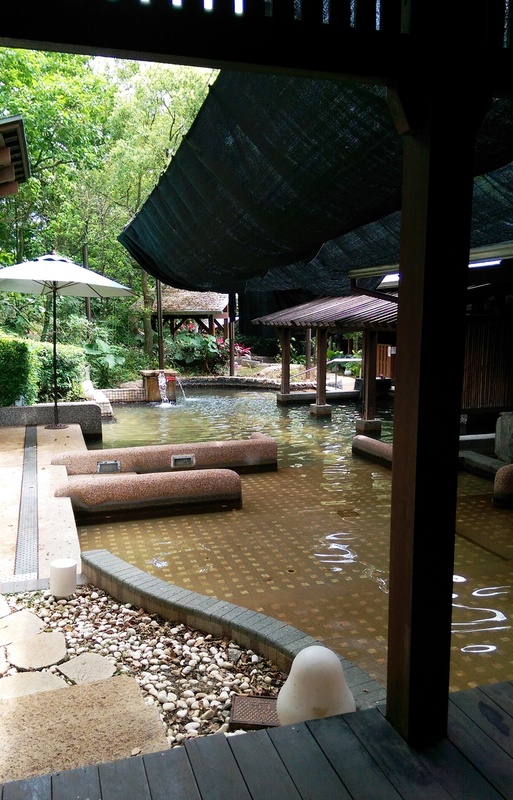 This place is a gem of a public onsen if you’re after unlimited soaking for a bargain price! At 150 TWD, this place is pretty hard to beat, even with all the 5-star hot spring hotels nearby. It is a traditional Japanese-style open bathhouse. Which means men and women are separated and you must only bring your birthday suit. Before you enter the pools, you’re also required a splash-down with the pints of water provided. Shower caps, and towels are available for purchase at the front desk if you didn’t bring your own and lockers are also available near the pools. Most hotspring destinations in Taiwan require bathing suits, so if you haven’t visited a Japanese onsen before, you may be a little skin-shy. But before long the water will make you so relaxed and your skin as soft as a baby’s bum, that you really couldn’t care less. My friends and I found we had the pools to ourselves most of the time. It was so good, we came here pretty much everyday we were in Yilan! Pro-tip: The male and female sections interchange at different times of the day. So to experience the park’s entire facilities, make two trips or more like we did: one during the day and one in the evening. It’s a pity because of the shortage of water Taiwan is currently experiencing, that they shut down the Water Park, so really it’s just Dongshan River Park now. But don’t despair, in my opinion the river itself is the main attraction and there’s nothing like a long scenic bicycle ride along the banks. Rent a bike at the park for around 100 TWD and go whichever direction tickles your fancy. You will pass giant dinosaur replicas which make me think the park originally had plans to be some sort of expo park but failed. However, this was definitely one of the highlights of our trip and we were snappy-happy with the wonderful views of water on one side and rice fields on the other. Pro-tip: It will take you a decent half day to do the whole length of the river (approximately 4 hours), so make sure you pack some water and snacks or are well-fed to begin with. There are kiosks in the park itself, but as you take yourself further along the river, you will have no choice but to turn back or head away from the bike trail towards the nearest town if you’re after any mid-ride refreshments. 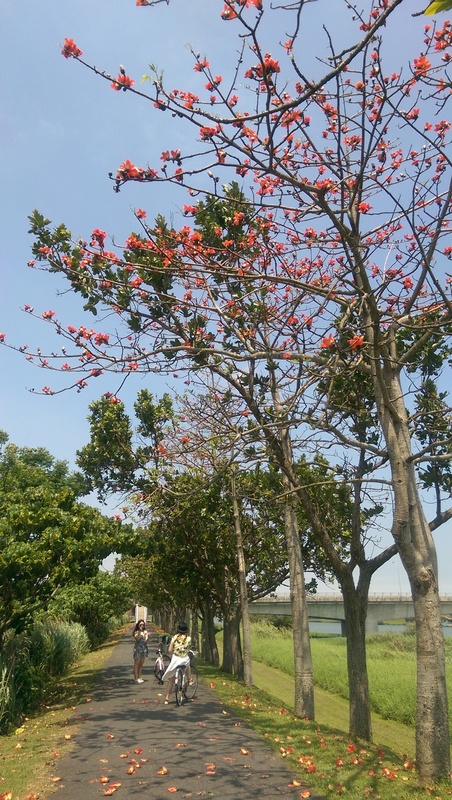 Riding in Spring will also allow you to make the best of the scenery with bright red and orange cotton tree blossoms lining part of the bike trail. 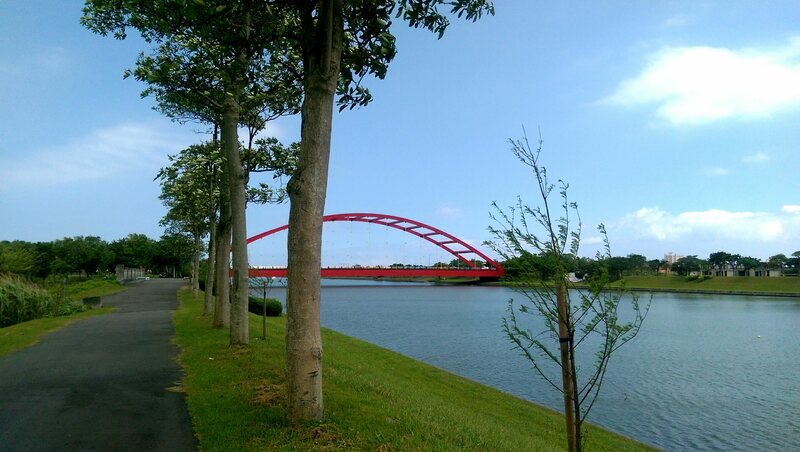 Even in this tiny county, you will find a modern museum to learn of the local culture and environment of Yilan. Located in Toucheng’s wetlands a short distance away from Jiaoxi, Lanyang museum took 7 years to complete, and the nature-inspired architecture itself should evoke some admiration. However, it is the exhibitions spread across four levels, that will take you through the natural and cultural resources Yilan has to offer. It will take about 1.5 hours to walk through the museum if you’re happy to read-up a little. Pro-tip: Take a little stroll across the bay (towards Wushi Harbor 烏石港) to get a front on view of the museum on the water. This accentuates the unique architecture even more and you will feel inclined to take more photos of the unique scene like we were. Being the closest to Taipei for surf, Yilan can get pretty busy with beach-goers and surfers alike in the summer. There are plenty of places to hit when the surf’s up in Yilan and you would have heard of Fulong (福隆), Wushi (烏石), and Wai-ao (外澳) as popular surfing destinations. At this end of the island, the sand is black which makes you think you’re just getting dirt all over yourself, and on a cloudy day, doesn’t seem like the picture perfect sunny beach weather you would generally associate with. But what it lacks in looks, it makes up for with decent surf and Wushi and Wai-ao seemed like a good place for both beginners and experts to test out. Remember to check local weather surf forecast as the area is known to have rips. It is also easy for you to rent surfboards for about 500 TWD a day at multiple surf shops along the main street running along the coast. Pro-tip: After battling the waves at Wushi or Wai-ao, stop over Section 3 of Qingyun Road where you see a line of cars pretty much stopping traffic. They’re there for one or two things only, the ice cream from 阿信師芋冰城 (where you can experience natural local flavours such as taro, red bean or pineapple), and the grilled sausages of 宜蘭名膳佩等路. I got this pro-tip from a Taiwanese surfer so it’s legitimate local knowledge! They’re delicious and guaranteed to take away any hunger pangs after a day of surf or swimming! We visited other sights in Yilan as well, but for us, these were the stand-out places to visit if you only have a weekend and don’t want to travel too far from Yilan city. For longer stays, Taipingshan National Forest Recreation Area (太平山) makes an excellent day trip, but be prepared to pay a much more exorbitant amount of taxi fare (easily 2500 TWD and more!) if you don’t already have a car. Getting There: Yilan is really a hop and a skip away, and extremely convenient to get to by public transport. It is cheaper to go by bus and Kamalan and Capital Star bus services are both excellent, with free wifi and several pick-up drop-off points in Taipei and Yilan, taking only about 1.5 hours each way. Kamalan stops nearby Technology Building MRT station (科技大樓站) while Capital Star departs directly from Taipei City Hall Bus Station (市府轉運站). There’s no need to pre-book your tickets as buses run every 15 minutes or so! Alternatively you could catch a regional train from any TRA station such as Taipei Main (台北站) or Songshan (松山車站) for a little more cost.